It’s Farmhouse Friday!! 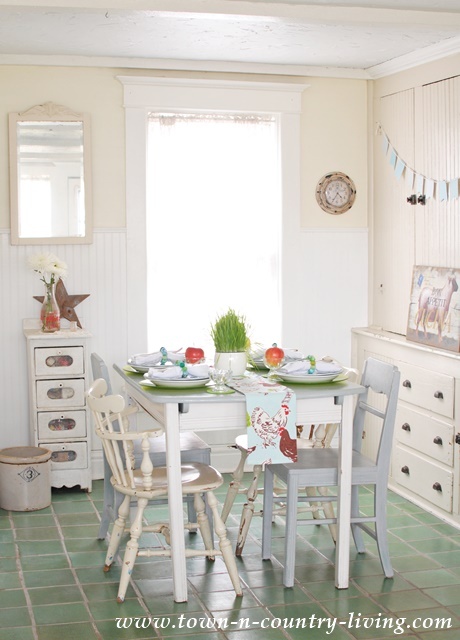 I love Farmhouse Friday which occurs the 4th Friday of each month and includes 5 other bloggers with farmhouse style. 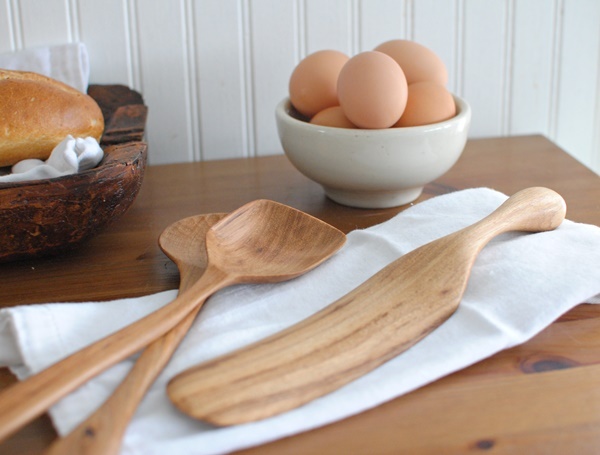 This month’s theme is the Farmhouse Kitchen and I’m super excited about it because Polder’s Old World Market is offering $350 worth of their beautiful hand-carved wooden chef utensils to one lucky winner! 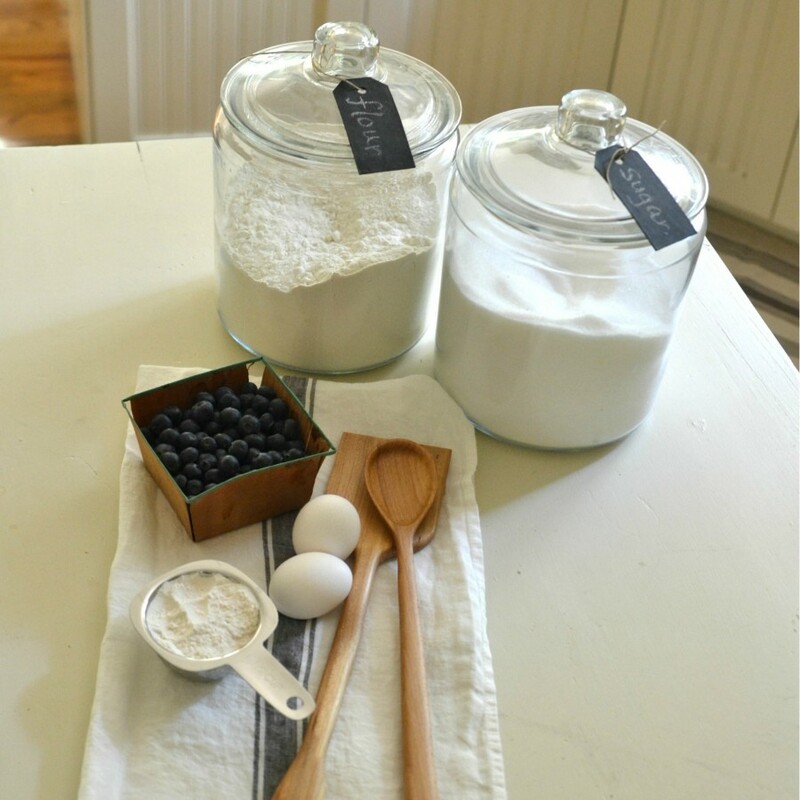 The entry form is at the end of this post, along with links to my farmhouse blogging friends so you can see their pretty kitchens too! 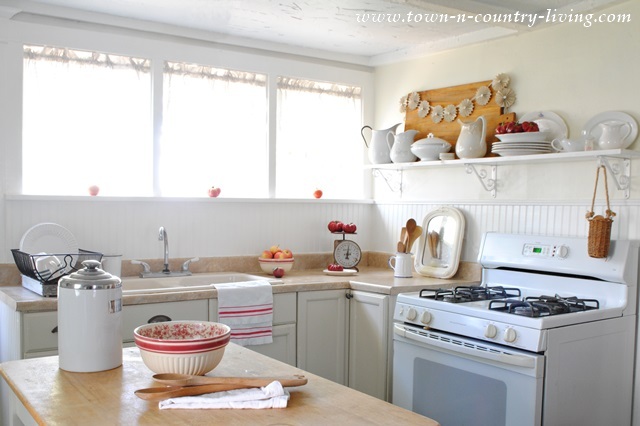 For me, a farmhouse kitchen is simple and functional. Not fancy. Not filled with high end gadgets. 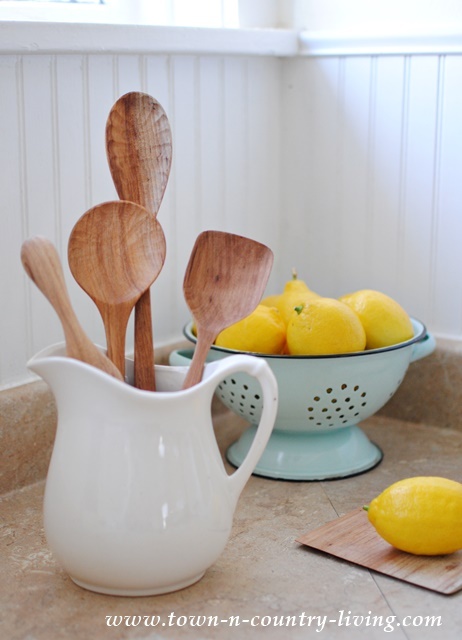 Instead, you’ll find utilitarian objects with an organic feel like hand carved wooden spoons. 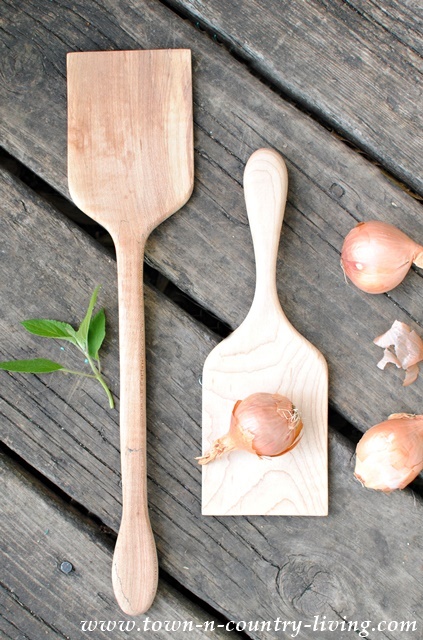 I’ve blogged about these amazing chef utensils before from Polder’s Old World Market. My latest acquisition from Polder’s are these handcarved spatulas made from maple wood. I love the way they feel in my hand with the smooth carved wood. Polder’s is currently offering 35% off their collections and sets through May 31st. But like I said earlier, you can enter to win $350 worth of their products using the Rafflecopter form at the end of this post! Back to my kitchen, which has no upper cabinets, just open shelving that we installed several years ago. I was afraid upper cabinets would block all the natural light that flows into the kitchen. Even though this room is on the north side of the house, it always has great light … even on gloomy days. When I decorate my home, I like to add unexpected elements. Like the vintage mirror you see here resting on the counter. Who puts a mirror in the kitchen? I have 4 in my farmhouse kitchen. Not because I’m vain and like to look at myself … I just like old mirrors, is all. This one is just the right size to cover up the outlet and it helps reflect the light streaming in the windows. On the other side of my farmhouse kitchen is the dining nook. See … here’s another one of my kitchen mirrors. A stoneware crock that I scored at the flea market for $5 sits in the corner by the little painted cupboard. Most of my spices are in that cupboard, which I’ve had for about 30 years now. If you’ve visited my blog before, you’ve probably seen my built-in cupboard which is typical of older homes. 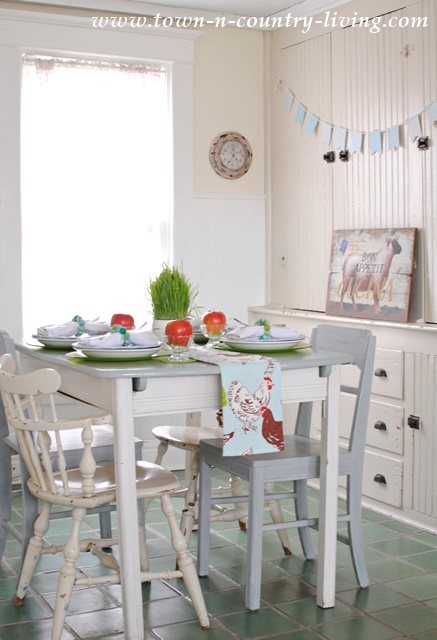 The chickens on the table runner are a perfect addition to a farmhouse kitchen. Any barnyard animal will do! 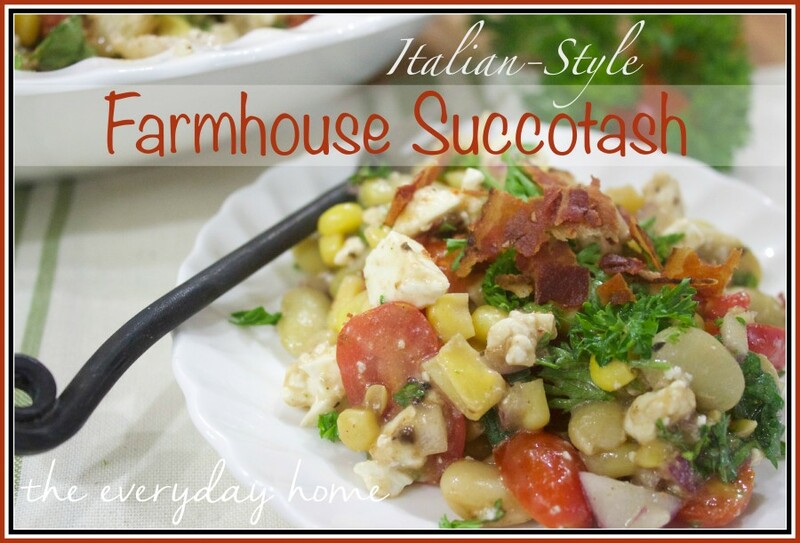 What I love to do most in my farmhouse kitchen is cook … especially making recipes from scratch using vegetables and herbs from the garden. 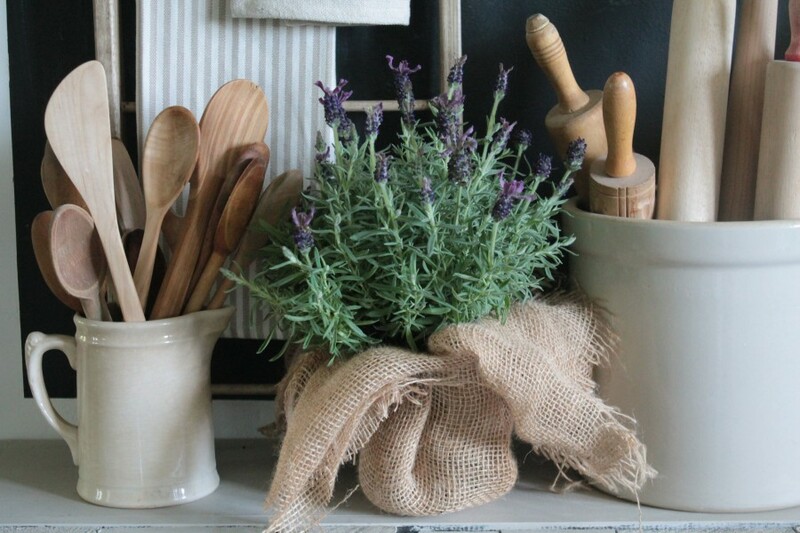 A few decorative items like an old scale or vintage bowl add farmhouse appeal. My favorite decorations are the ones that are functional as well as pretty. 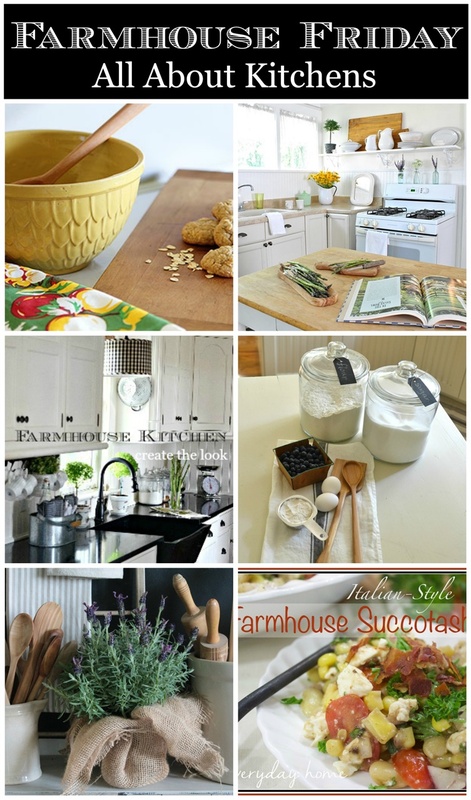 Be sure to visit the rest of the bloggers that are sharing their love of farmhouse kitchens! 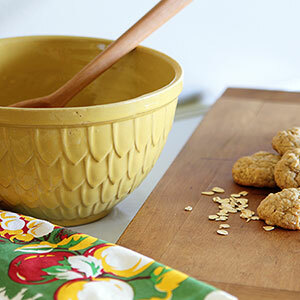 And enter below to win the $350 giveaway from Polder’s Old World Market! 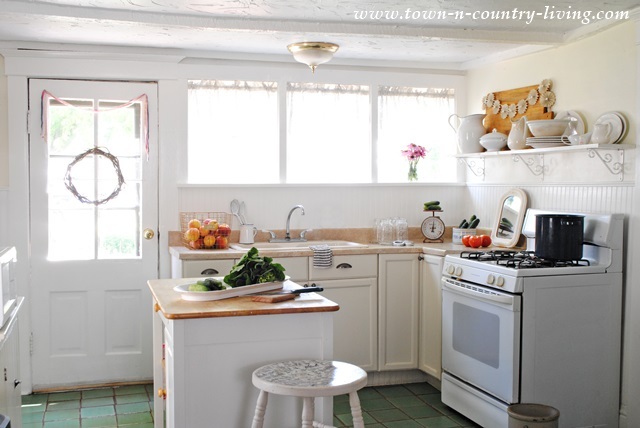 You have such a pretty farmhouse kitchen. 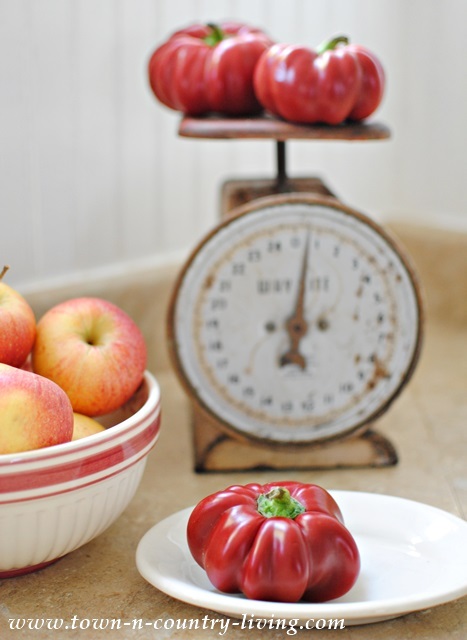 And I love that photo of the scale with the apples in the bowl right next to it. Very pretty all around! Wonderful tour of your kitchen. I always enjoy seeing this spot. 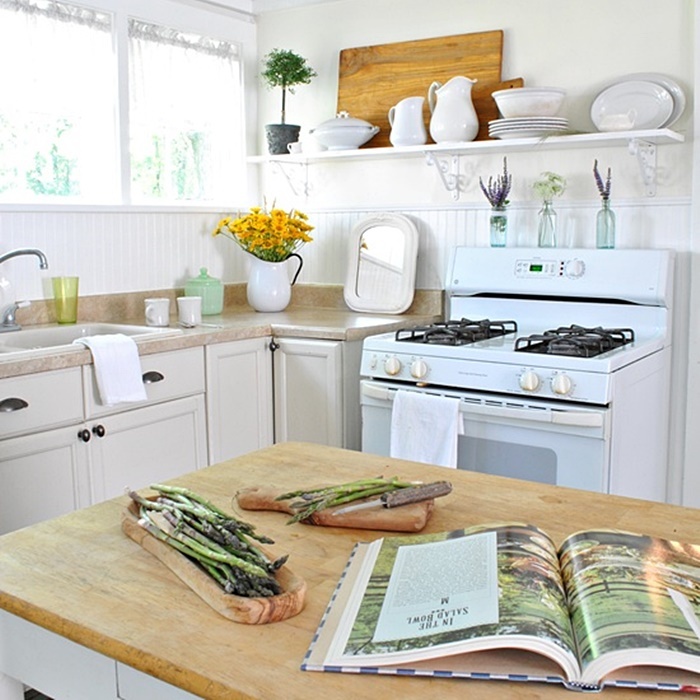 I absolutely love your kitchen and all the natural light that radiates throughout! Simple and beautiful! Love! I’ve been a subscribing for a while, it was your kitchen that caught me first. Then your outside colors! We live in a house of similar vintage, we’ve been here for 32 years and it’s still not the way I want it. After finding you, I have a clear direction and we’re working on it bit by bit. We’ll have it done before we peg out, I think, ha ha ha. Thank you so much for your taste and style and generosity, sharing your home with complete strangers, inspiring to better living! 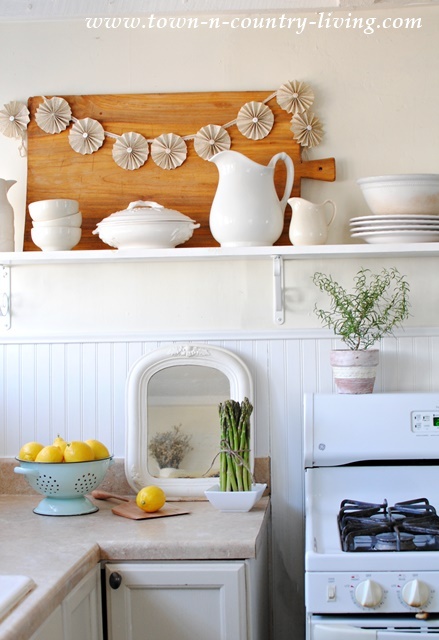 Love the simplicity of your kitchen! 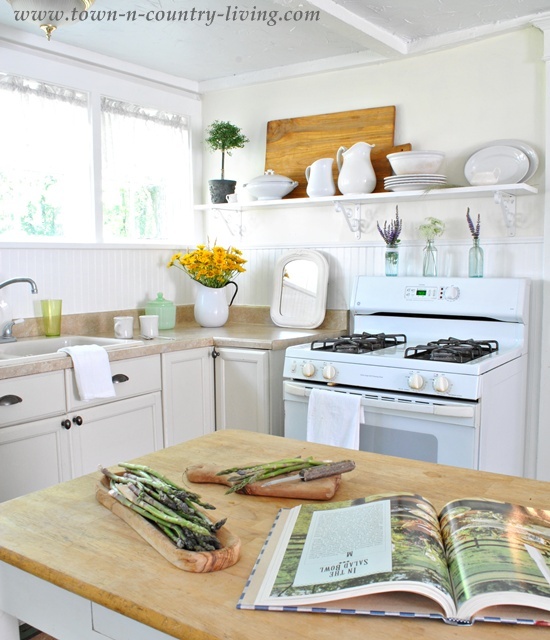 Beautiful farmhouse kitchen! !…Love all of the wonderful details. OMG, luv ur kitchen. Divine, functional. Splendid. . Wow, prize $350 gc is fab. & splendid. 2 fingers snap. It is tight, fly & off the chain. Thank you for the awesomeness, the contest, and generosity. 🙂 Pick me, pick me! Your kitchen is gorgeous and, although, mine has modern looking appliances and built-in cabinets, there are elements I want to use. Thanks for sharing. I always love seeing your kitchen. It looks so cozy and inviting. And the utensils from Polders are simple stunning! Its looks so beautiful and simple stunning. Thanks for sharing.